Friday, March 11, 2011: Up early and on the road under sunny skies and comfortable temperatures in the mid 70’s. We received news of the devastating earthquake in Japan and the resulting tsunami that may impact the California coast. So what do we do? 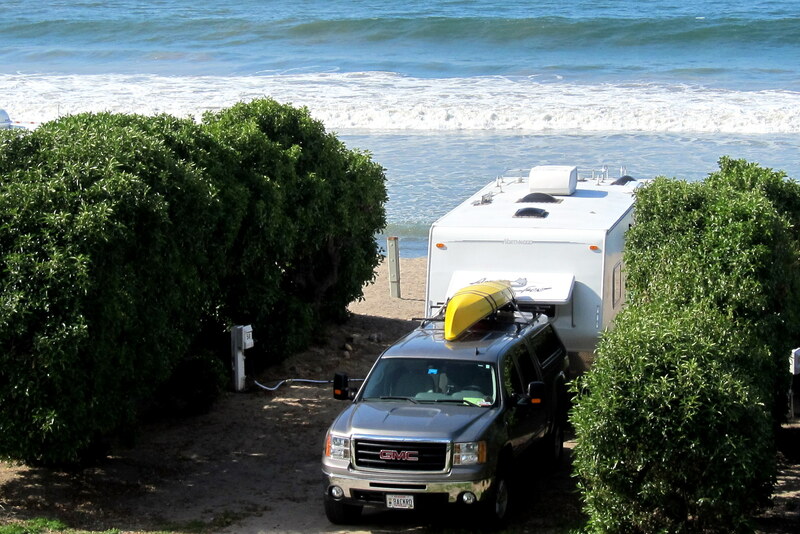 Why, head to San Onofre so we can camp on the beach at an elevation of 5 feet above sea level. 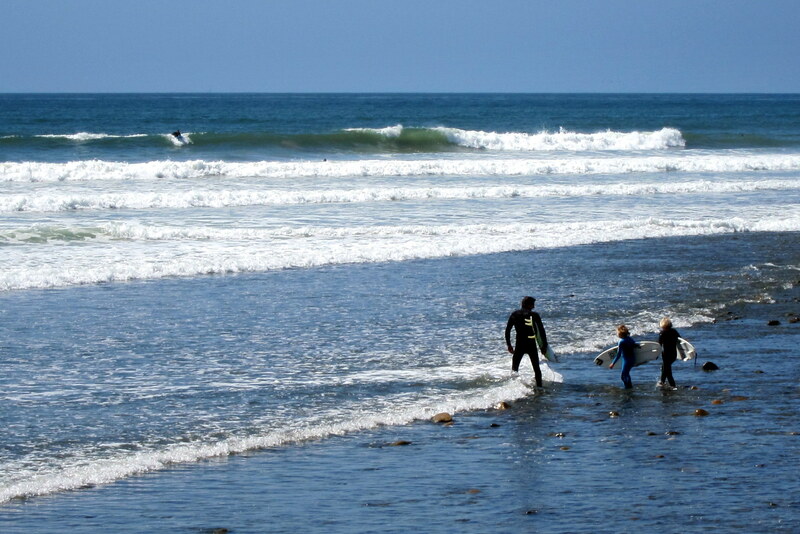 We traveled up I-5 heading north and arrived at the San Onofre Beach campground around noon. After setting up camp we enjoyed the rest of the afternoon walking the beach before falling asleep to the sounds of crashing waves. Saturday, March 12 through Monday, March 14, 2011—San Onofre, California: Well the tsunami wave hit the shore and was barely noticed. However down in San Diego Bay there were a few boats knocked about and on Mission Bay a large bait barge overturned. 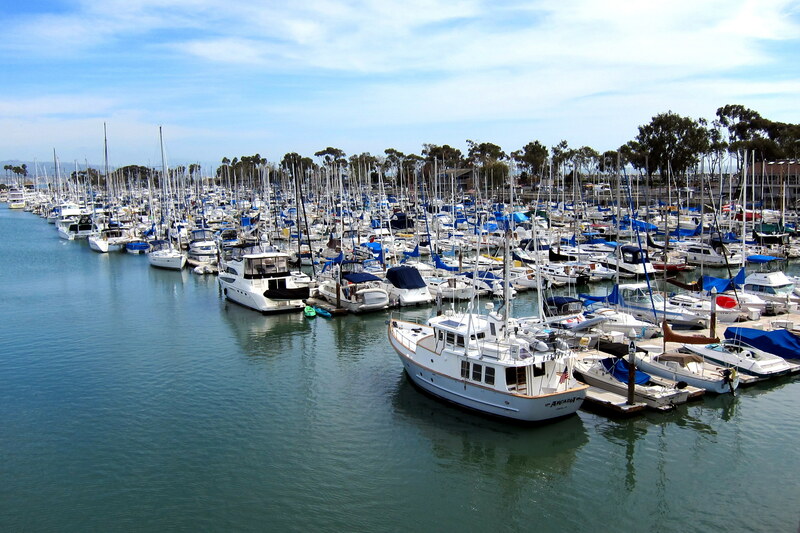 I have a funny story concerning a bait barge on San Diego Bay and my son Joe’s close encounter with millions of guppies. See me sometime and I’ll relate it to you. Listening to NPR this morning the scope of the devastation that occurred in Japan due to the earthquake and resulting tsunami was frightening. Having visited Japan and knowing folks of Japanese descent, we share the worlds sorrow at this unfolding tragedy. The Japanese people are industrious and strong and they will rebuild…..better than ever. The campsite we selected is very nice and mere feet from the crashing surf. We have stayed here each of the past two Excellent Adventure trips and it continues to be one of our favorite campgrounds. 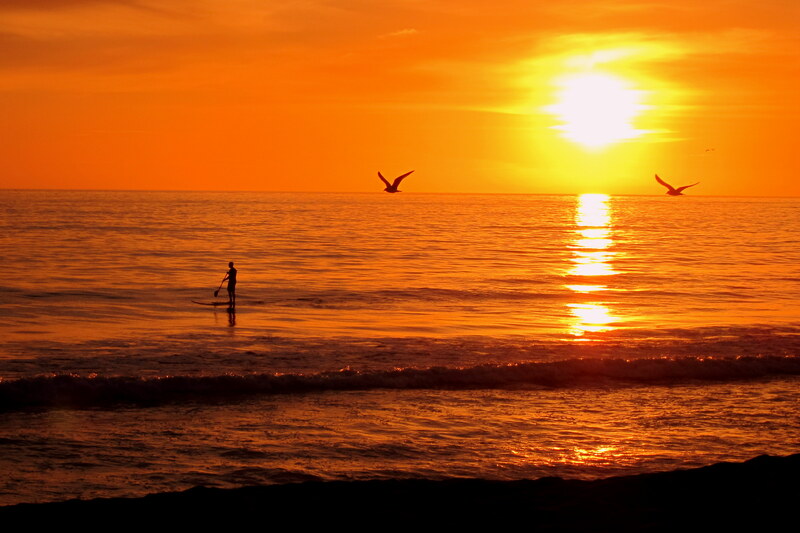 It is extremely relaxing to fall asleep while listening to the surf while smelling the fresh salt air. In addition there we can sit in our beach chairs and enjoy the view and watch the day’s activities. There were surfers of all shapes. 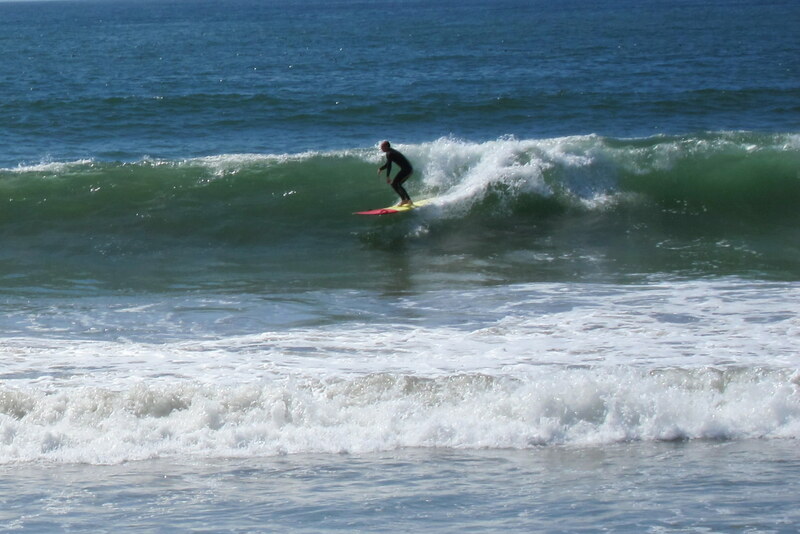 And sizes…..these Grom were about 5 years old. What’s SUP you ask? Not much what’s up with you? 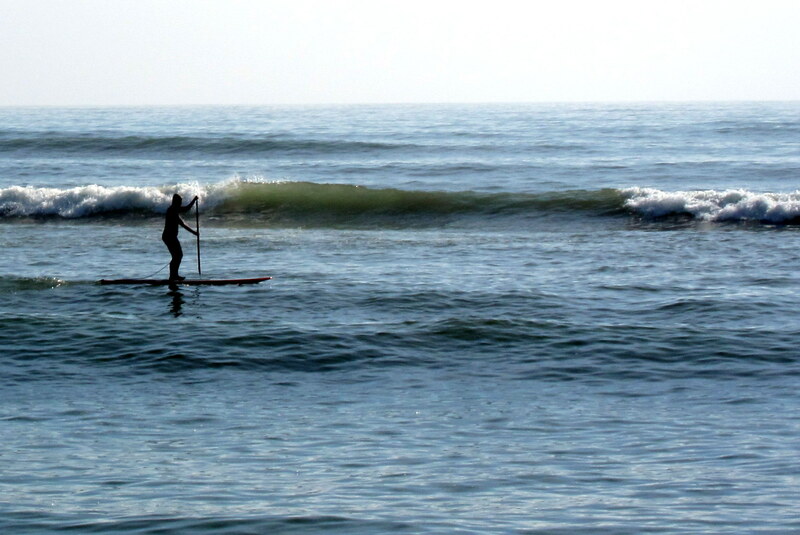 Sorry…..SUP stands for “Stand Up Paddleboard”, an old form of water sports currently popularized by the great Laird Hamilton. And there were very attractive beach bunnies checking their e-mail on their new smart phones. In addition, a few porpoises got into the action as well. And we were fortunate to select a spot right next to an interesting and enjoyable couple. 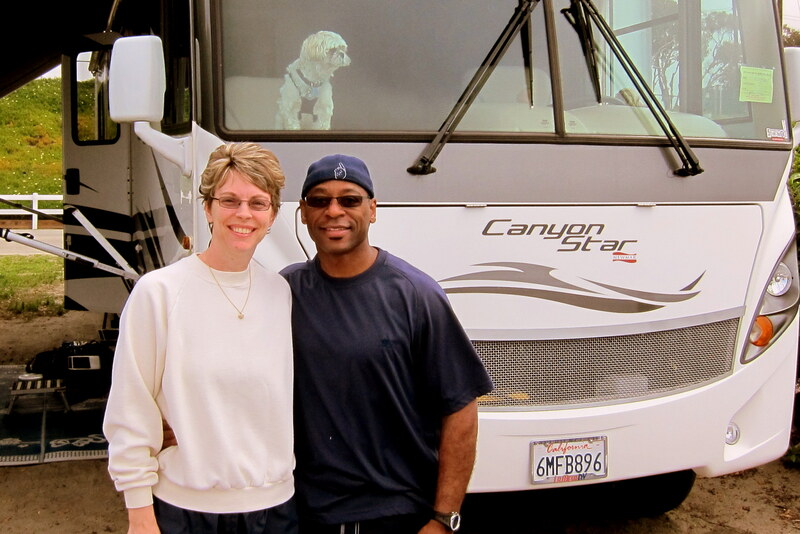 Mike is a retired Navy guy and his wife Angela works for the government on Camp Pendleton. We had a great time visiting and swapping sea stories while their little pooch intently watched what was happening down on the beach. Wind speed and direction is important to the surfer. An onshore wind will cause the wave to break quickly and shorten the ride. However an offshore wind (think Santa Ana Winds) will affect the wave positively and cause it to grow larger before gently breaking. This wind/wave interaction will produce the perfect wave for the best ride. 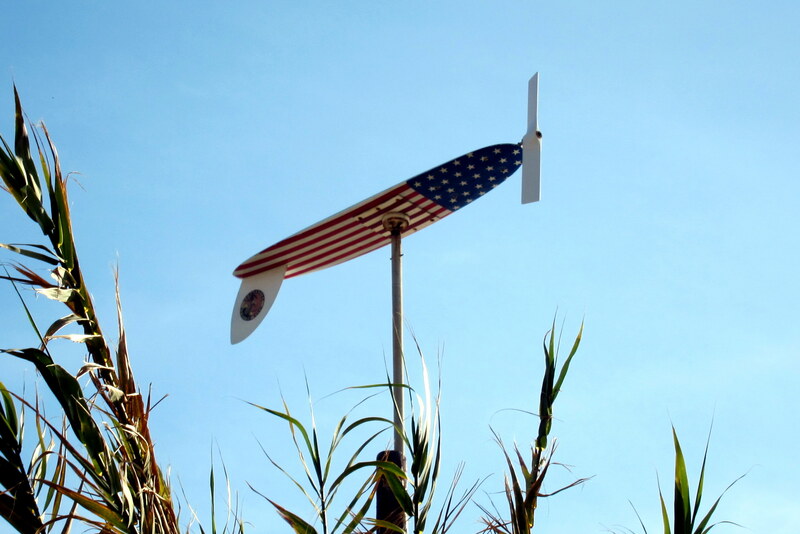 San Onofre has a sophisticated anemometer to accurately monitor both wind speed and direction. My Bruzzin and Bruzzin-in-law happen to be in California staying with our cousin/nephew, Mike in Long Beach. Kit and I decided to make a day of a trip up the Pacific Coast Highway to visit with them. All along the coastline, the scenery was incredible. 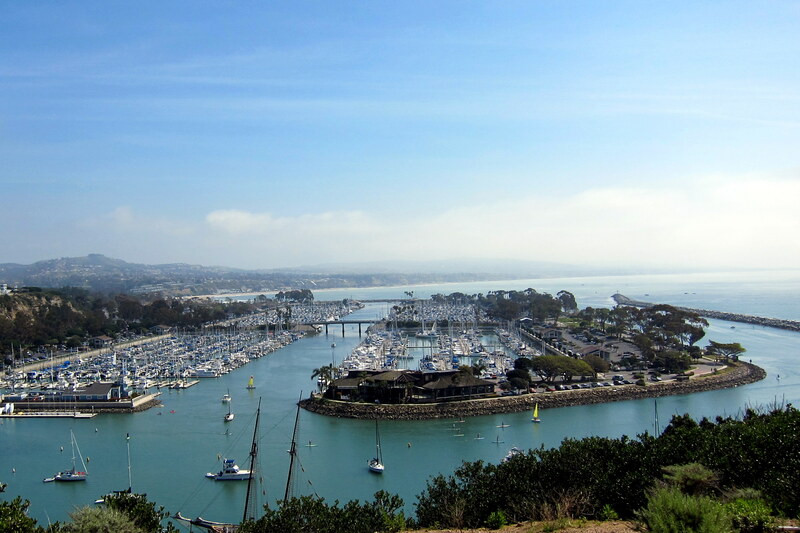 We made a mid-day stop at Dana Point for some walking around time and to grab a bite to eat. There were zillions of expensive boats. 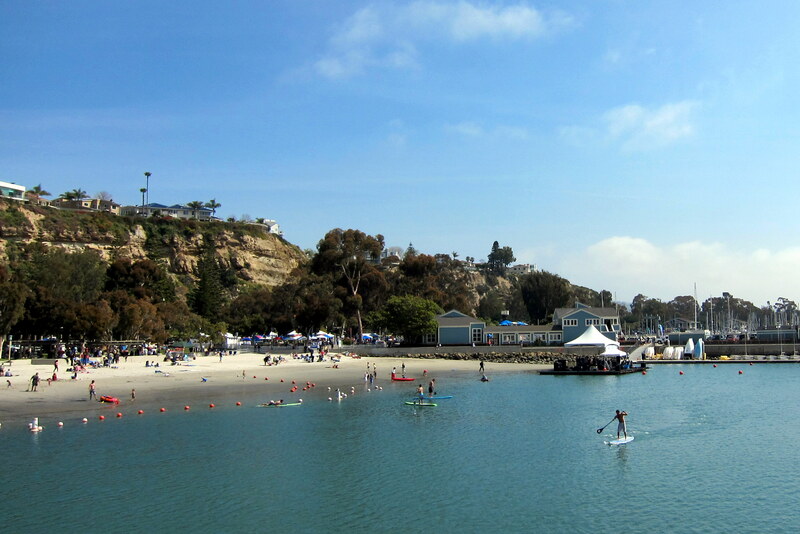 And a nice beach with a moored barge that held a live band playing California Surf Music. There is a very strong car culture in California. We passed dealerships for Bentley, Porsche, Ferrari and Maserati. 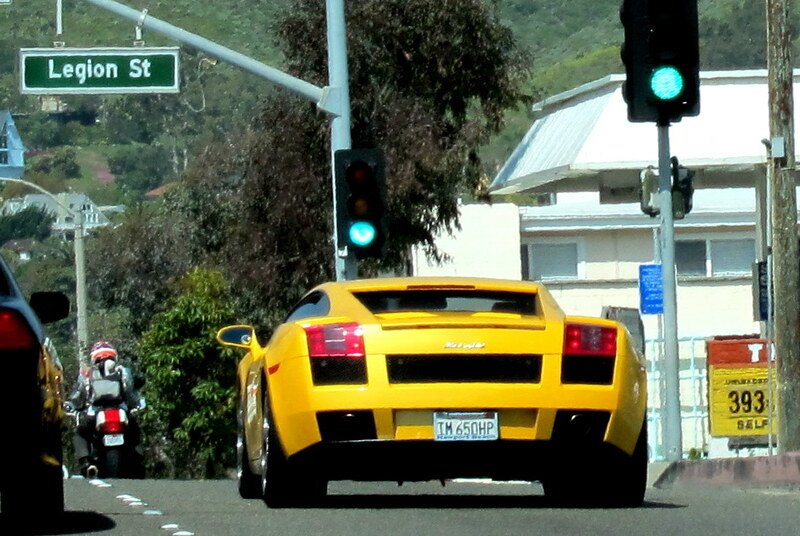 Driving through Newport Beach, a number of go-fast cars sped by…..I was able to get a photo of the slowest of the bunch. Yep, that license plate reads “IM650HP”…..and the thing looked like a toy! 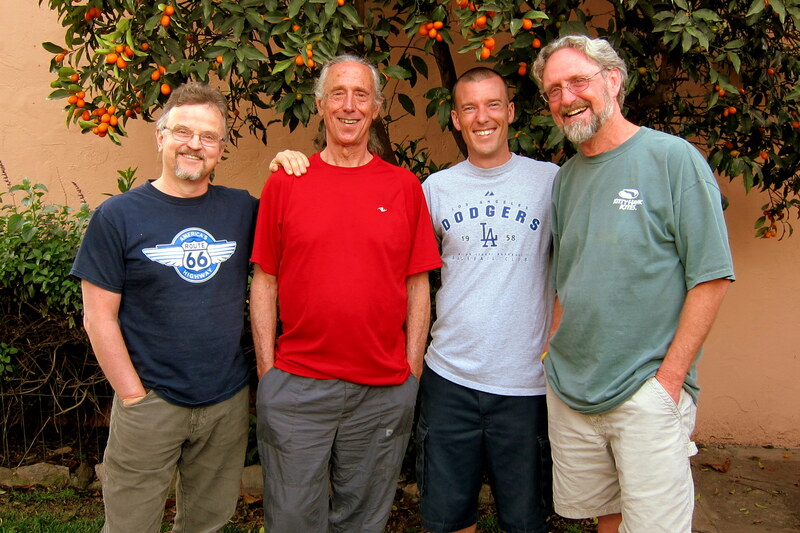 Arriving in Long Beach, we had a great time visiting with Bea, Mike, Dewey and Dewey’s son Kevin. 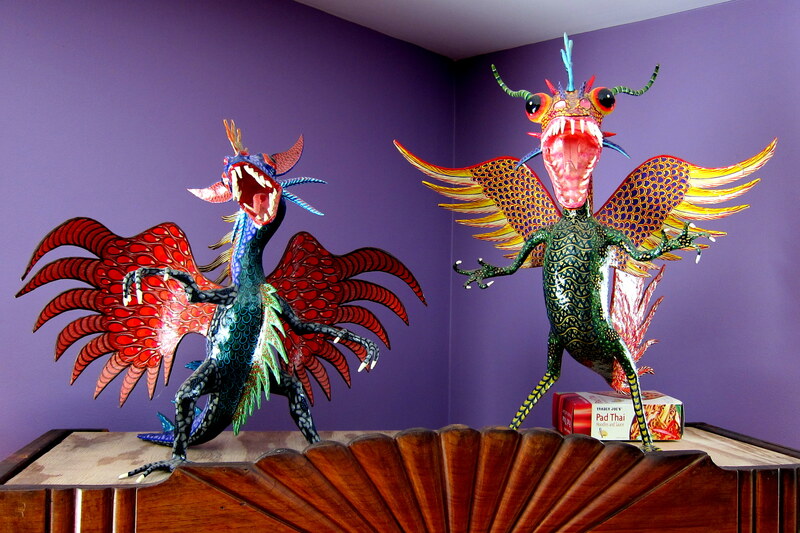 Mike has an extensive collection of Mexican Folk Art that he has displayed in his home. The place was incredible….. it felt like we were in a museum. Mike is an authority on this art form and travels extensively in Mexico to seek out its best practitioners. Back at our beachside campsite we enjoyed another restful evening. 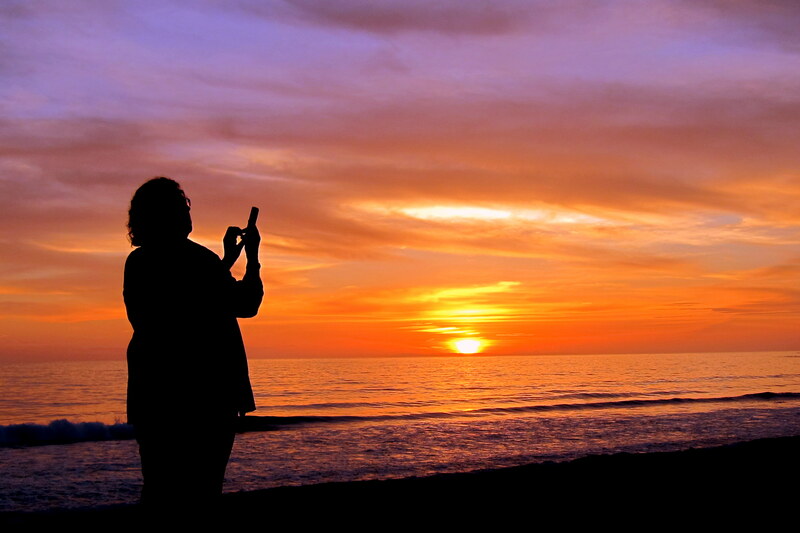 Stay tuned for more fun in the sun in San Onofre! 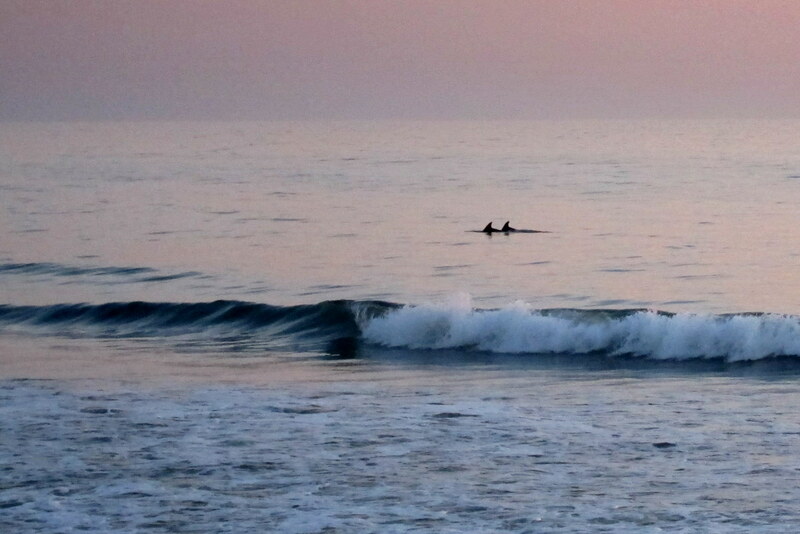 Thanks…..maybe next year you can come up and see us in San Onofre. 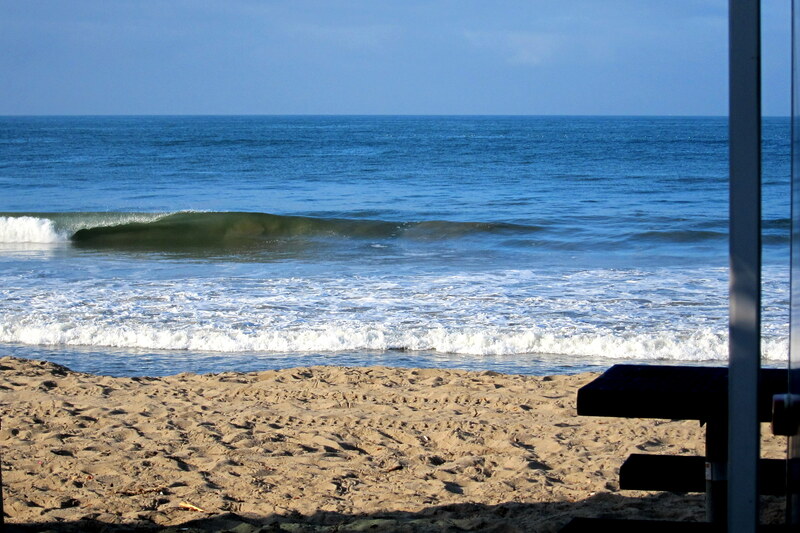 San Onofre looks like a very restful place to be…I love the surf and salt air. 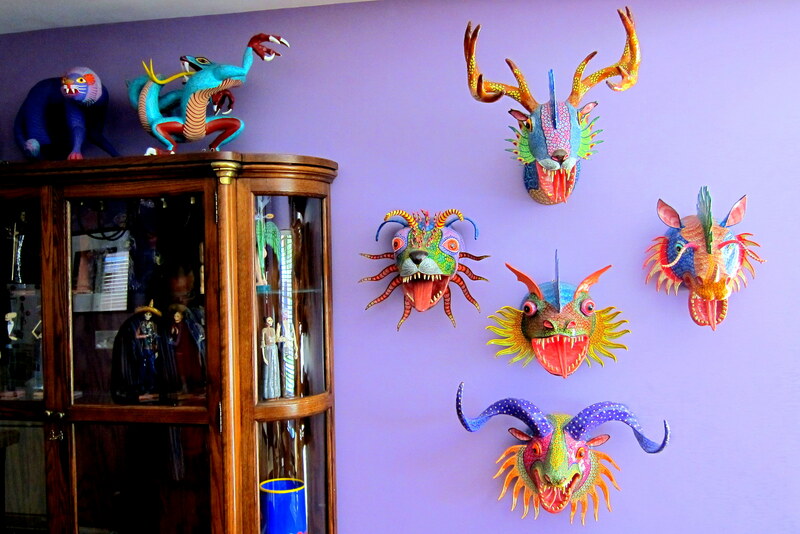 Love the Mexican folk art…but I’m afraid it would keep me awake nights…lol. Mike had the pieces throughout his house….must have been near a hundred of them. I can only imagine the value of all these original pieces of art and each had an interesting story behind it. It was really pretty incredible! I tell ya, each time I read your journals for your excellent adventures takes me back to my childhood. Really looking forward seeing the two of you. Meanwhile, keep traveling and enjoying this country we live in. What a sunset!!! Wow, when I thought your pictures couldn’t get any better WHAM!! there they were! Incredible! That RV spot has got to be the best RV spot that there ever was! Absolutely beautiful! That could have been an entirely different visit if that sunami had decided to pay a visit! Wow, you might have ended up visiting an entirely different part of the coast than you expected!!! I enjoyed this adventure immensely! Thanks again…..I really like to take photos but the truth be told I don’t really know much about the art of photography. I just go by the philosophy that if one takes an abundance of pictures then the law of averages dictate that some of them will be OK. I really enjoy your article. I am a student and working on an assignment about Las Vegas. Do you mind if I use the photo with Celine Dion’s sign on a taxi for my article? Thank you so much!